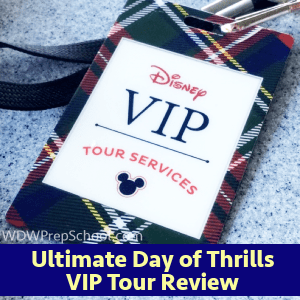 I am a big thrill ride fan, and since I don’t always visit Disney World with likeminded people, the Ultimate Day of Thrills VIP Tour seemed like a great way for me to enjoy all my favorite rides in a single day during a brief three-day trip. I had never booked any sort of VIP experience through Disney before, but this one had my name written all over it. My fiancé will usually (reluctantly) appease me by going on all of the thrill rides, but said this tour wasn’t up his alley. Instead, I invited my fearless 8-year-old niece, who had never been to Disney World. I thought this would be the perfect first experience for her! The Day of Thrills tour is part of Disney’s The Ultimate Series of Tours and includes access to some of the most popular rides in The Magic Kingdom, Disney’s Hollywood Studios and Animal Kingdom via FastPass+ admission on Tuesdays, Fridays and Sundays. It also includes a Table Service lunch. Disney’s VIP Tour Services cannot be booked online (call 407-560-4033) and costs $318.44/person after tax, plus the cost of a Park Hopper ticket (the tour guides scanned our tickets at each park) — definitely not cheap. My niece and I arrived at Magic Kingdom at 8 a.m. for the tour’s 8:15-8:30 a.m. check-in time. A Cast Member at the left side of the park entrance (where tour groups and early breakfast reservations holders check in) found our names on the tour list and we were able to enter the park early on what otherwise would have been a 9 a.m. opening day. This allowed us to leisurely walk down Main Street — where PhotoPass photographers were already set up — and take some nice, unobstructed castle photos. We were greeted by a Cast Member at Tomorrowland Terrace. There, we received our VIP Tour Services badges, name tags and menus for The Brown Derby so we could place our lunch orders before starting the tour. There was also a table for people checking in for the Ultimate Day for Young Families VIP Tour. Both tables had pins and adult and child sunscreen bottles. In addition, there was a table set up with coffee, tea, juice, water and some cereal bars. We each took a bottle of water and I took two bars to snack on later in the day. Tomorrowland Terrace also has great castle views (it’s where the Wishes Fireworks Dessert Party is held), so we took a few more photos. Our tour group of 22 guests, along with our three tour guides (Disney offers one guide for every 10 guests) and the two coordinators who checked in regularly, headed over to Casey’s Corner around 8:45 a.m. There, they spoke about the tour briefly and we were off to Frontierland for Splash Mountain (which may have set us a little behind when it broke down for about 10-15 minutes) and Big Thunder Mountain Railroad. Next up were Haunted Mansion (we ended up skipping this one so my niece could use the restroom) and Seven Dwarfs Mine Train. After Mine Train, we took a 20-minute break by Gaston’s Tavern before walking over to Space Mountain. Note: The tour may have also included Pirates of the Caribbean had it not been closed for refurbishments. Be sure to check what’s closed during your visit. The next part was especially exciting — we were able to exit Magic Kingdom via a Cast Member entrance in Tomorrowland, where one of the tour coordinators was waiting with frozen towels and water bottles. The 22 of us piled into three white vans, where we passed around candy and mints and drove to another Cast Member entrance at Hollywood Studios. What a timesaver! The Hollywood Studios entrance was right between Rock ‘n’ Roller Coaster and The Twilight Zone Tower of Terror. We rode Rock ‘n’ Roller Coaster first and then went over to The Brown Derby for lunch around 11:35. I am a big fan of The Brown Derby’s food and enjoyed the meal and downtime. This was also the first time we really had time to chat with the other people on our tour and our three tour guides, who sat with us during lunch. Our tour guides were very friendly and knowledgeable — a few of the teens at our table were interested in working at Disney and they offered some advice. They also showed us some hidden Mickeys in the parks and discussed some strategies for using FP+ for those (non WDW Prep School readers!) who had questions. Next, we rode Toy Story Midway Mania and Star Tours. After a quick restroom break, we ended our Hollywood Studios time with The Twilight Zone Tower of Terror (a few people chose not to ride). Then it was back into the air-conditioned vans with more cold towels, water and candy for a ride to Animal Kingdom. We entered through the DINOSAUR gift shop and rode that one before our tour concluded at Expedition Everest at about 3:35 p.m. From there, we were given the option to stay at Animal Kingdom, hop in a van back to Magic Kingdom or take a van ride to the Transportation and Ticket Center. The efficiency. I was a lot less fatigued at the end of the tour then I would have been had I spent those seven hours touring the parks myself. I am a fast walker and like moving through the parks pretty quickly, but only with this VIP access would we have been able to accomplish so much so fast. As a result, we had enough energy to go to Epcot afterward (after a 30-minute break at our resort), take advantage of those FP+ reservations and feel super accomplished about doing 15 rides in one day! Ride lines. Currently, you can only make three advance FP+ reservations in one park per day and this allowed us to hit 11 popular attractions, all with FP+ admission — probably the biggest draw for the tour. The longest we waited was about 15 minutes at Toy Story Midway Mania, but nothing compared to the 85-minute standby. The itinerary. Even though this is a “thrills” tour, it includes some popular non-thrill rides (I’m looking at you, Toy Story!) which was a nice treat. Early entrance to Magic Kingdom. During my last trip, I experienced this by booking an 8 a.m. Be Our Guest reservation and this offered the same benefit of entering a near-empty park for some great photo ops. This alone makes me feel like a Disney VIP! Van transportation. Feels so luxurious compared to waiting at bus stops and boarding crowded buses! WDW transportation is a huge consideration when park hopping, but this really minimized those efforts and was a HUGE convenience. Tour guide knowledge. Having Cast Members around us all day allowed people in the group to ask anything about WDW. They also knew the shortest routes from place to place, which cut down on our walking time. Meeting new people. Although the only real time to chat with our fellow tour-goers was during lunch, it was nice to hear where everyone was from, learn a bit about their trips, discuss our favorite attractions, etc. I haven’t had a chance to really talk with other Disney fans like that in the parks before and really enjoyed it! You must purchase a Park Hopper ticket and tour ticket to participate in the tour. The tour is fast-paced. Our guides often hurried us along if we were looking at ride photos or if someone wandered through a post-ride gift shop. There was no time for unplanned restroom/refreshment breaks or opportunities to stop for photos (unless you were willing to skip a ride). The expedited access is just entrance to the FP+ lines just like everyone else who has a FP+ for that time period — you aren’t “cutting” lines altogether. In fact, a few times we had to wait a little longer than smaller FP+ groups so our whole group could ride together. You can’t wait for or request certain seats on rides like you might be able to do otherwise in order to keep the group together. You can opt not to ride any ride. The tour does not include Epcot, although since you are required to have a Park Hopper ticket, you can make FastPass+ reservations there for after the tour like we did (one of our guides said including Test Track and Soarin’ would have added about 90 minutes to the tour). You won’t ride anything more than once or any rides that aren’t part of the tour. You are traveling in a big group, which can be an adjustment if you’re like me and used to only walking the parks with a few other people (I learned there are some more aggressive walkers who wanted to make sure they were the first ones on every ride!). I think our group represented a good mix of people who would enjoy the tour — thrill lovers of all ages: adult couples, teenagers, and children (Disney recommends 7+) who won’t mind being on the move for that long without breaks. In some cases, one parent took the thrill-loving child(ren) on the tour, while the other parent enjoyed a slower-moving day with a younger child elsewhere. This tour could help make sure everyone is happy if you’re traveling with a group with varied interests! The Ultimate Day of Thrills VIP Tour might also be a good option if you are visiting during an especially busy time of year or an especially busy day (our tour was on a Sunday in busy June). It also may be something to consider if you are taking a shorter trip and want to make sure you get in all the thrill rides. It also opens you up to use your FP+ for other attractions, so you don’t feel like you have to miss as much. 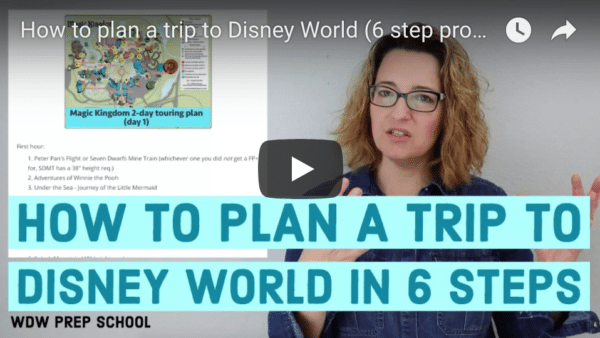 I typically plan my Disney trips roughly by the hour, with room for flexibility, as Shannon recommends. This usually leaves time to jump on other, non-FP+ rides, between reservations, or if someone loves a ride, to hop on the standby line for a second ride. While my family thinks I am a crazy planner, I enjoy having both structure and some flexibility, the latter of which this tour does not allow. My niece was new to all the rides and there were some she would have liked to do a second time, but the tour doesn’t allow for that. While I don’t recommend letting this tour be the only planned part of your Disney trip, it was a really great and fun supplement for my short trip and a great introduction to Disney for my niece. While I love rides, stopping for photos, viewing parades, entertainment, etc., are all important and memorable parts of my trips, too! So they replaced two thrill rides (Dinosaur and Everest) with a single, non-thrill ride (Soarin), and they replaced Hollywood Brown Derby (a high end, expensive table service restaurant) with a non-descript Quick Serve meal in Magic Kingdom :-/ Sounded good in this review, but I don’t know if it’s really worth it now. If you’re going all the way to EPCOT it would be nice to get in another ride. Why not Test Track or even Frozen Ever After? Just seems a waste to go there just for Soarin considering it’s a thrill ride adventure. This is a recent post but the Disney website mentions a visit to Epcot, not Animal Kingdom and lunch at Sunshine Seasons. When did you take your tour? Great review! My wife and I did this a couple of years ago and absolutely loved it. We are looking to go back this September and of course we would do it again. It is worth noting that as of today, the Ultimate Day of Thrills no longer visits Animal Kingdom, so no Dinosaur ride or Expedition Everest. Bummer! They did add Soarin’ in the others’ place, however. So for the same price I believe there are less rides. Perhaps that will change by the time September rolls along. Anyway, I would highly recommend this tour, because you get to feel like a VIP without paying the $400 per/hour cost for a true VIP experience. We are going to WDW in April, 2017… On the day we might do this we have a dinner reservation at Ft. Wilderness Campsites (Mickey’s Backyard BBQ Dinner Show) at 5:30pm… would we have enough time to get there after this tour ends? Thank you thank you so much for all the information! I’m a crazy planner and every day at Disney for me is jam packed from start to finish. I’m taking this tour at the end of September and you answered so many questions I had that the 407 WDW-TOUR line didn’t answer. You rock! Enjoyed reading about your experience Shannon. I’m from the UK and am planning a solo trip to Disney (my first visit ever to Disney Orlando) next year (family all grown now). Although staying on-site and planning to visit all the parks, this sounds an excellent way of making sure I get to ride all the thrill ones. I can then visit each park again at a more leisurely pace. I can hardly wait! This would be a good thing for visitor’s who are “rushed” to see all of Walt Disney World in one day. Several years ago my wife and I met a frazzled mother and son from Australia on holiday who were touring the U.S. They had only one day at Walt Disney World and were frantically trying to get all of WDW done in this one day! This service would fit the bill. Expensive yes, but great memories sometimes can be purchased!